Long ago and far away, Etsy and I weren’t acquainted. *gasp* I know. Therefore, when I was looking for a reusable pad for my Clorox Ready mop, I had nowhere to look really, but Ebay. It did the job I suppose, but the overhanging material constantly got flipped under and gummed up the works, then the fleece flaps would slip out and the whole pad would fall off. Plus, it was made out of a prefold, so it often ended up just absorbing most of my liquid instead of actually mopping the floor! Not too long ago, I was browsing Etsy and came across QwertyO’s Store. She makes ready mop pads (these also fit the regular/not wet jet swiffers), pads for the Swiffer wet jet, reusable produce bags and reusable sandwich bags. The bags are made by her 17 year old daughter. QwertyO generously offered to send me a pad for my ready mop. 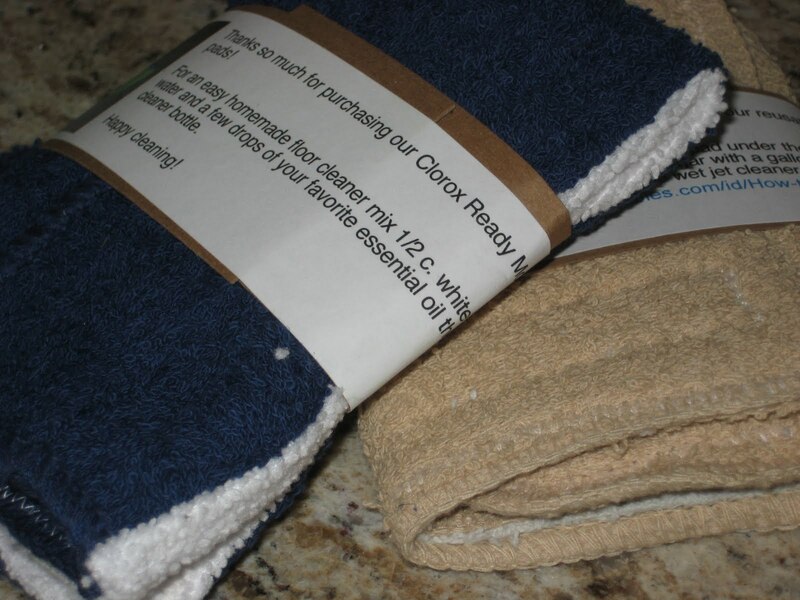 She is also sponsoring a giveaway, so read on my fellow moppers! 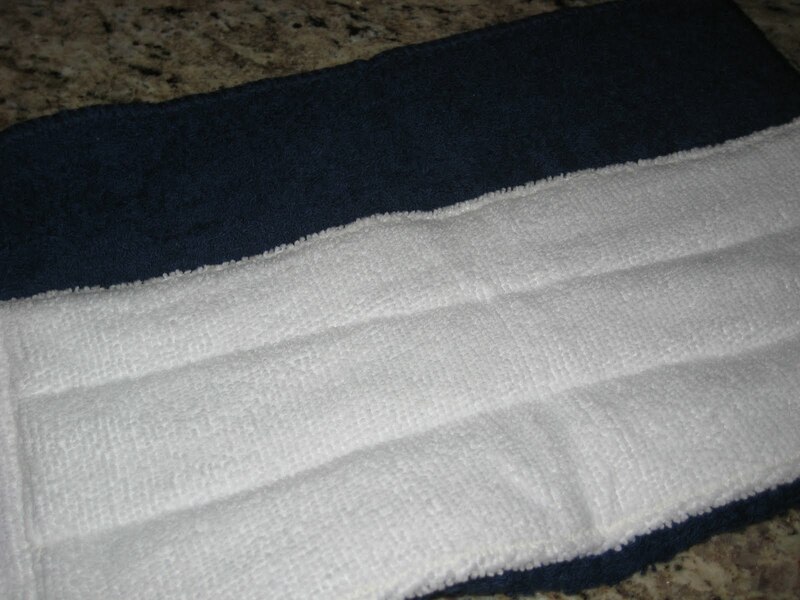 Susan also sent a Swiffer wet jet pad to share with a friend. I intended to test, photograph and review it as well, but I’m still hunting for someone local who still has one. Many people I know got rid of theirs because of the chemicals, but she included instructions for opening your wet jet solution bottle and making your own, earth friendly solutions! The package really was a present! Instructions for homemade solution were right on the package. The Swiffer pad packaging includes a link to instructions for opening the bottle of solution to fill it with your own. It’s all terry and has the same velcro attachments as the disposable pads. 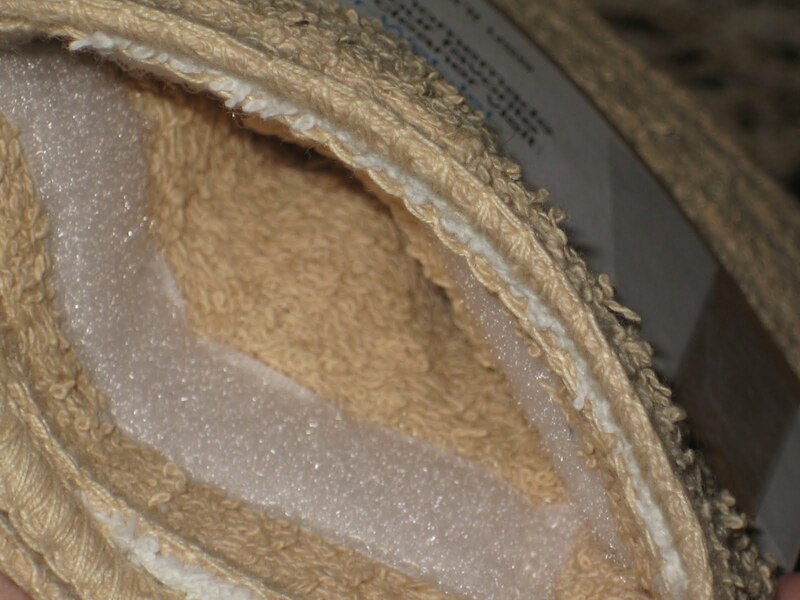 The ready mop pad is microfiber on one side and terry on the other. The wide border of terry allowed me to really secure the pad onto the mop. I was able to mop without having to stop and stuff it back in at all! I love my QwertyO reusable pad. It’s so nice to be able to grab my ready mop for quick cleanups, without dragging out the mop and bucket. Now I can do it more efficiently and in half the time since I don’t have to wrestle with my old pad! Doesn’t my floor look great? Want it? Buy it at QwertyO’s Etsy shop. Want to win it? QwertyO is generously offering one lucky reader his/her choice of a set of wet jet pads, a set of ready mop pads or a combo set of 7 reusable produce bags. Susan chooses the colors. 1. Visit QwertyO’s Store and tell me which of the 3 options you would choose if you won. 3. “Like” me on Facebook. Current fans count. Comment saying you’re a fan to get your entry. 7. Add QwertyO as a favorite shop on Etsy. Comment that you added her as a favorite to get your entry. I will accept entries until Tuesday, May 11th, 2010 at 9:00 P.M. Please note that all of my giveaways are available to residents of the U.S. only unless otherwise specified. Please be sure to leave your email address in your comment if it isn’t in your profile. If I can’t find contact info for the winner, I will choose someone else. Thank you to QwertyO for providing the two pads for review and the products for the giveaway winner as well! >I would choose the ready mop. Thanks! >I'd love the 7 reusable produce bags. Great stuff! >and I would get the reuseable veggie/produce bags! I always hate using the bags there…it's such a waste. >I would choose the produce bags. Thank you! >tweet!http://twitter.com/heart4home/status/12940816708a_heart4home at yahoo Do you think she'd let me choose 1 swiffer cover and 4 produce bags?